Hello from India! Hope all of you are doing good and enjoying the summer. Today I have a world traveler and obviously another food lover for you ! It would be a couple of years now, that I have known Sala. Sala of Veggie Belly is an adventurous foodie, who travels around the world and her food is exquisitely influenced by her adventures. Veggie Belly is all about wonderful vegetarian food and also the twists that she gives to the popular non vegetarian recipes. Who would have though that a vegetarian South African Bunny Chow could look so good?! You should hop over and read about her & the tales of food and travel; very interesting and lot of fun at the same time! Her recipes are innovative and delectable, as she brilliantly blends and fuses flavors and ingredients from all over the world in a pot, and stirs them to present the most intriguing and surprising platefuls. I myself love experimenting with food and when I see her skills, tastes and experience to create the kind of food she does, it makes me want to dive in right away and give it a try. Don’t forget that she also has the traditional Indian recipes and the basics of them. It will be unfair if I do not mention that Sala also happens to be a fantastic photographer. Her food photography is inviting and sure to make you drool, while you virtually travel in her paths while you browse through her travels. Those of you are going to be in her blog for the first time, you will know what I am talking about. An “entrepreneur” during the day and lovely blogger and cook by the night, she is one charming lady with a lovely smile, you will fall in love with. Now enjoy the recipe and the photographs she has brought here in eCurry and then jump over and spend as many hours as you want at Veggie Belly! I have been reading Soma’s delicious blog since its beginning and have come to adore it for its gorgeously styled, delicious food. Soma’s creativity, talent, and passion for food constantly remind me of why I love the food blogging community so much. 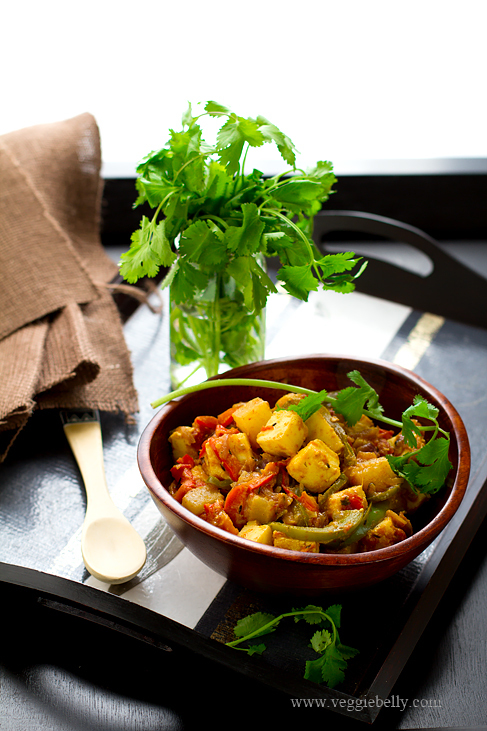 I am so thrilled to guest post this Kadai Paneer with Pineapple recipe on eCurry today. Kadai paneer is one of the first dishes I ever learned to cook. Later on, I added a little pineapple to my recipe for a surprise sweetness. If you enjoy a bit of fruit in your curries, you could also use dried apricots, dried cranberries or dried pineapple in this recipe. If a fruity dish isn’t your thing, simply leave out the pineapple and add a tablespoon of tomato ketchup instead. If using store bought paneer, cut the paneer into cubes and soak it in hot water for 10 minutes. Then drain. This will soften the paneer. Skip this step for fresh or homemade paneer. Heat oil in a large wok. Add the cumin seeds, cloves and cinnamon. When they sizzle, add the onion. Cook on medium-low heat till onions are soft. Then add ginger and garlic paste, stir for 1 minute. Add chili powder, turmeric, and coriander powder. Stir another 30 seconds. 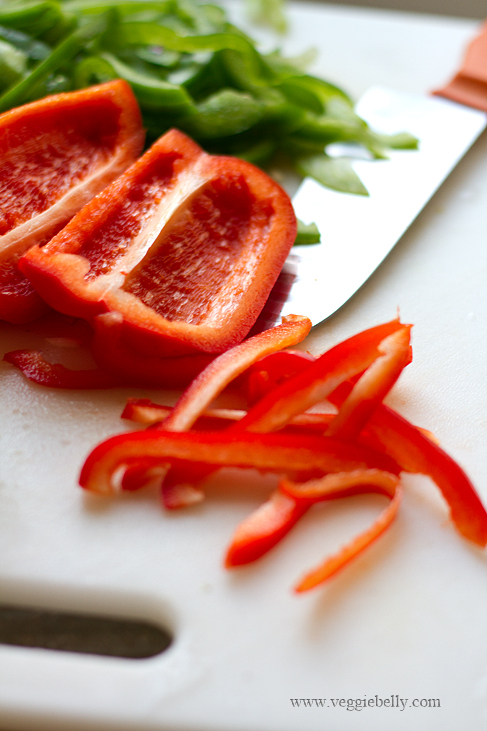 Add chopped bell peppers to the work, stir so the masalas coat it well. Then add Tomatoes, and cook for 4 minutes or till the tomatoes break down and become soft. Now add salt, pineapple, dried methi, and the paneer. Toss gently till everything is well combined. Garnish with chopped cilantro. June 17th, 2011 | Category: Dry Fries, Sides & etc. Thanks for having me guest post! Hope you are having fun in India! Beautiful pictures…this looks absolutely wonderful. This is perfect for the heat of summer that has just hit Dubai. 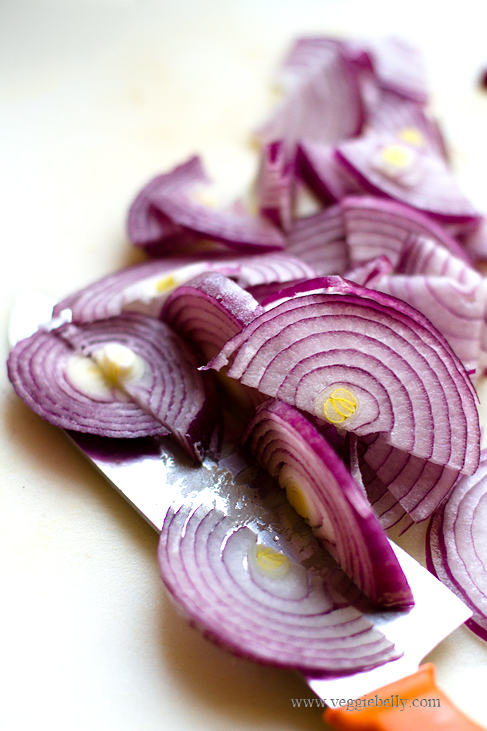 I really like the purple onions pic too. 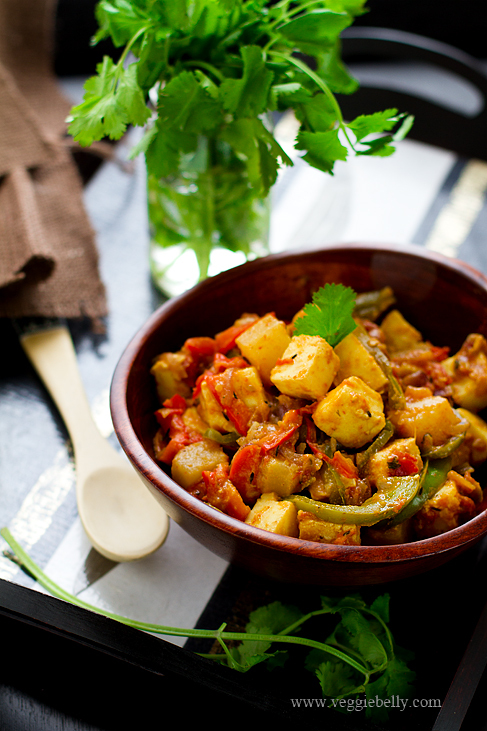 Delicious looking kadai paneer. Excellent pics. Btw, hows you doing and how are the lil ones ? I heard it’s raining badly in Kolkata ! Kadai Paneer sounds delicious, especially the addition of fruit!! !